For a full loft clearance, we’d recommend taking a look at our 6-yard skip. It’s got plenty of space without becoming impractical, especially if you need the skip close to your house to help make logistics a little easier. 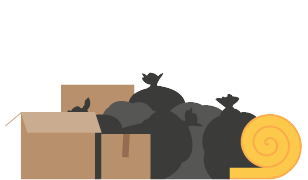 When it comes to what goes out of the loft and into the skip, the contents can vary wildly from household to household.. Whatever you’re getting rid of, we’re confident we can offer a solution that’s right for you. Plus, we’ll make sure that any recyclable items that you put in our skips are sent to a reputable recycling plant to keep your disposal an environmentally-friendly process. After all, one man’s junk is another man’s treasure. Electronic items have to be specially disposed of by law, so if you’re planning on putting plenty of old electronics into your skip, it’s probably best to give one of our waste professionals a call. They’ll be happy to give you a tailor made quote for disposing of your electronic waste. It’s also worth noting that if there’s plasterboard involved, it will need to be placed in a separate bag and put on top of the skip when we come to collect it. If that all sounds like a little too much to remember, you can always contact one of our friendly staff for the best advice on how to manage and handle your loft waste; we’re only a phone call away.